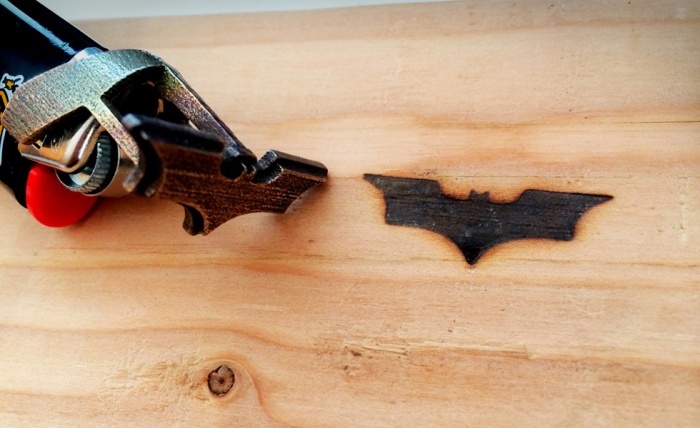 The Dark Knight is Everywhere: Batman Branding Iron | OhGizmo! By Hazel Chua on 08/29/14 • Leave a comment! A new Batman movie is in the works, which is great news for Dark Knight fans everywhere when Christopher Nolan’s trilogy wrapped up. If you’ve still got bat fever and want to show the world what a huge fan you are, then you might want to consider getting this Batman branding iron. As the name implies, it’ll let you brand everything you have and own with the bat symbol. From your front door and notebooks to your leather sofa (think twice before you actually brand your Lazy Boy, though), there’s nothing this 3D-printed bat iron can’t brand with a little heat. It’s available online for $30.